It’s been happening for years. As long as there’s been a live voting sequence at the Eurovision Song Contest some countries seem to be more…supportive…of one another. With the massive expansion of the Contest in the semi-final era (from 2004 onwards), this challenge, be it related to a diaspora, or membership in a culture sphere or bloc, seemed for a time to get worse. Many of the debutante countries from the post Soviet/post-Iron Curtain/post-Yugoslavia era shared cultural spheres, languages and musical traditions. This particularly became a challenge when some blocs’ members persistently rank each others’ entries above all others, year after year, regardless (it seems) of song quality or artist performance. When we had over 20 countries competing for just 10 spots in a Grand Final, not being in a bloc proved disadvantageous. Of course, few would argue that most songs qualifying out of those mega-semi-finals were unworthy of an appearance on Saturday night. And let’s be transparent about something: in the first 15 years of the 21st century, these countries often tried harder at the Eurovision. They often sent their most polished performers and songwriters and invested a lot of sweat equity into prepping their 3 minutes on stage. But not always. Regardless, when it seemed that the emergent ex-Soviet and ex-Yugoslav blocs were grabbing nearly all 10 qualification slots in a semi-final, some countries who have participated in the Eurovision for decades felt the system was skewed against them. Remember that the mega-semi-final had a pan-European televote—including countries that weren’t participating in the semi-final. Which is why, over time, the two semi-final system we have today came into place. It’s also why we no longer use a televote alone to calculate scores: we know that televoters use all sorts of criteria for placing votes. Something as true of reality TV franchises like Idol. Of course this assumed that the only blocs in play were from “new” Europe. In fact, the longest standing—and arguably most productive this century—has been around since 1959: the Scandis. Thus, in this article we focus our lens on the Scandi bloc and it’s voting history in the semi-final era of the Eurovision Song Contest. Both the general public and national juries have near equal say in who wins the Eurovision Song Contest. Near equal because when two entries have the same aggregate ranking, the one preferred by the televoters gets ranked ahead. Even more important: the voting in each semi-final no longer is a pan-European one. Instead the participating countries in each semi-final, along with half the pre-qualified entries (the Big 5 plus the host) determine who qualifies. Balance, in other words, is the goal. And to make it seem more balanced, the EBU producers, with the oversight of the Reference Group, allocate the participants each year into pots. These are grouping of countries that tend to rank each other highly, year upon year. Each pot is then split across the two semi-finals. The pots are adapted a bit each year, to account for changes (countries dropping out, débuting, or coming back), and based on ongoing analyses of voting patterns. An asterisk (“*”) indicates a country that’s been in various pots in different years: there are some countries that either don’t figure in voting patterns or for whom the impact of any patterns is inconsequential. In some years there have been 6 pots with fewer members. The 2016 pots will somewhat different. The impact of bloc voting is different with respect to overall result versus qualification record. In fact, it’s qualification where the obvious skew towards bloc members appears. Obvious, however, doesn’t necessarily tell the whole story. There are six core members of the bloc (Estonia, Finland, Sweden, Norway, Iceland and Denmark). 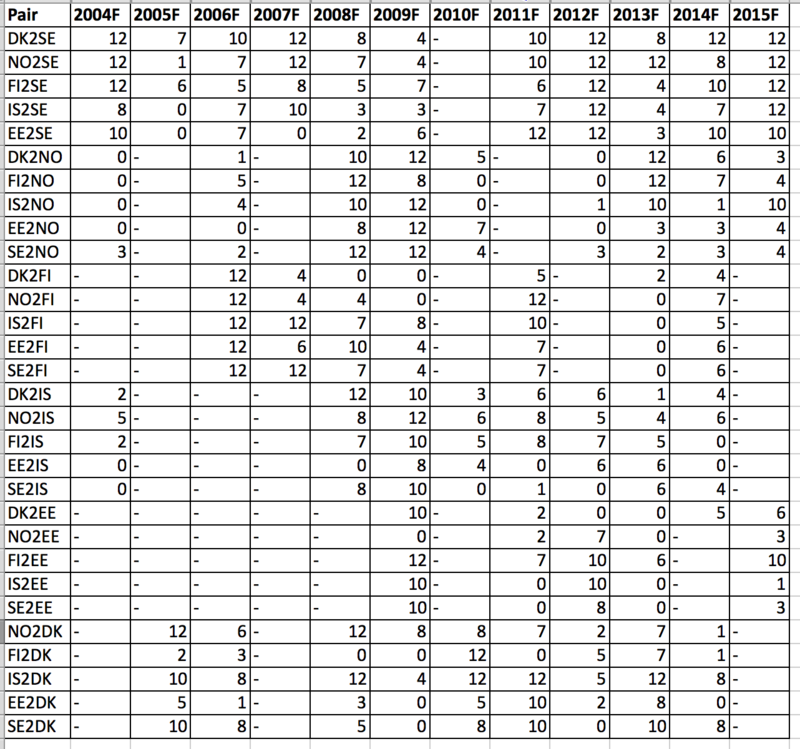 The graphic below shows how the semi-final points were allocated within the Scandi bloc, beginning in 2004. Note, however, that I have not broken it down by semi-final for years where there were two semi-finals; after all, we are concerned with point allocation in the semi-finals, plural. “-“ indicates there were no points to allocate (different semi-finals, or already qualified for the Grand Final), whereas a zero (“0”) indicates giving no points were awarded though it was possible to give points. For example: in 2004, Iceland, Sweden and Norway were pre-qualified for the Grand Final; Denmark, Finland, and Estonia were trying to qualify from the semi-final. None succeeded. Of the 10 entries that did qualify, five came from the Balkan bloc. The ex-Soviet bloc had only one entry qualify—but only had 4 members voting. 2005: Norway nearly swept the Scandi douze points. Sweden gave them a relatively stingy 8 points. 2007: Four Scandi bloc members tried to qualify from one semi-final. None succeeded. 2008: New, two semi-final system. Aside from Estonia’s piss-take entry, all the Scandis appeared in the Grand Final, although Sweden did so the jury “save”. 2009: All the Scandis in the Grand Final for the first time, although Finland is one of two jury saves. 2010: Introduction of the 50/50 voting combination for semi-finals and Grand Final. Only three Scandis in the Grand Final – the previous year’s winner and one from each of the two semi-finals. Sweden failed to qualify for the first time. 2011: Only Norway missed the Grand Final. 2012: Only Finland missed the Grand Final. 2014: Only Estonia missed the Grand Final. 2015: Only three Scandis in the Grand Final. With few exceptions, once Scandinavian bloc entries make it to the Saturday night show, they are well supported by their bloc. On average, four out of five bloc colleagues earn at least one point from their fellow Scandis. However, some members are more faithful than others. 2004: Norway, one of two pre-qualified Scandi bloc entries, avoided null points thanks to 3 points from Sweden. Sweden, meanwhile, earned an average of 10.8 points from the bloc. 2006: Finland swept the douze points from the bloc en route to a massive victory. 2007:. Only year with no Scandi bloc entry in the top 10. 2008: Beginning of an unbroken streak of top 5 ranking for at least one Scandi song. The Ex-Soviet bloc also shares this record. 2009: Three Scandi appeared in the top 10—including 1st and 2nd place. Norway earned 5/6 douze points from the bloc (Finland gave its 12 points to Estonia). This is also the first year a combined televote/jury is used in the Grand Final. 2010: Germany earned five out of six douze points from the Scandi bloc (Denmark gave 12 points from Iceland) en route to a massive victory. 2012: Loreen steamrolled to victory, sweeping the Scandi bloc. Her 18 sets of 12 points is an all-time record. 2013: Emmelie de Forest averaged 8.9 points from the bloc, en route to victory. 2014: Despite an average of 9.4 bloc points, Sanna only manages third place. 2015: Mans nearly swept the bloc’s 12 points en route to a jury-enabled victory (Estonia gave its 12 points to Russia). 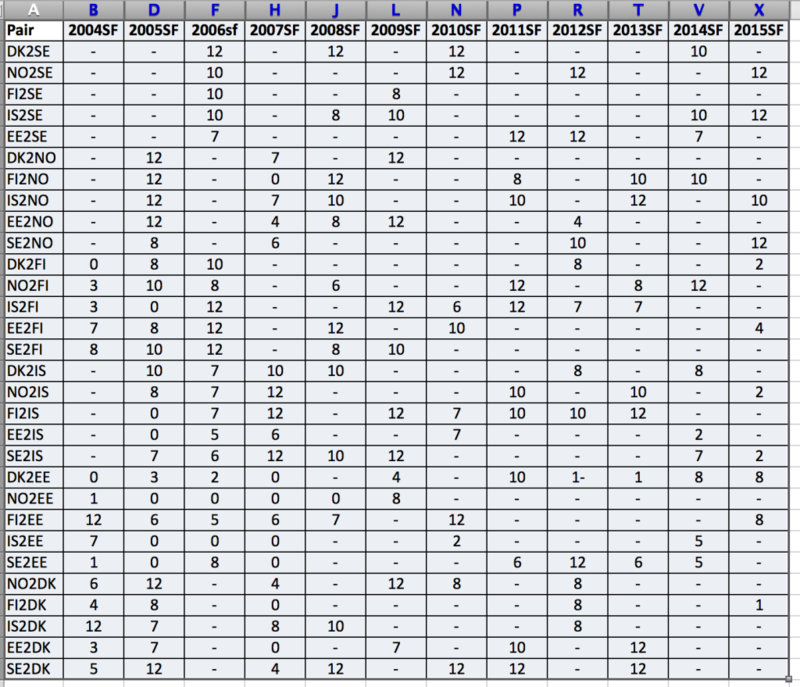 Since 2004 we have had 12 Eurovision Song Contests. Of these, one ex-Yugoslav, three non-bloc and three ex-Soviet entries have won. However, five Scandinavian entries have won: almost nearly 50 per cent! To put that in context: there have been between 36 and 43 entries each year from 2004 to 2015. The six members of the bloc have represented 14 to 16 per cent of the entries. On average this bloc should have produced no more than two winners. So we were curious: how much has being part of the Scandi bloc advantaged these entries, or played a role in their victories? On the face of it, not to an extent that determines the results: in most years the difference between first and second has been at least 30 points—sometimes much much more. But in statistical terms, to what extent are the core members of the Scandi bloc—Iceland, Norway, Sweden, Denmark, Finland and Estonia—scoring each other unusually well? The most painful part of this exercise was data scrubbing. After looking at this problem multiple ways, we settled on examining voting pairs within the Scandi bloc: specifically to see if there were any correlations between pairs of Scandi bloc members. We settled on correlation because it has an element of mutuality: a correlation score tells us whether or not a pattern of mutual scoring (positive correlation) or unequal scoring (negative correlation) occurs. In laypersons’ terms, it might help to think of this as a mutual love or exploitation. To simplify things we chose to aggregate both semi-final and grand final scoring. That means in some years as few as two bloc members shared a semi-final: any of the years when the host was a Scandinavian one – Copenhagen, Malmö, Oslo or Helsinki. Once these data were entered into Excel we imported them into SPSS, which is much more nimble for running statistical analyses. we subsequently ran every possible correlation between all bloc members from across all the semi-finals and Grand Finals. As it turns out there is precisely one correlation between Scandi bloc members. A rather surprising one, in fact, between one of the oldest (1958) and most recent (1994) bloc members. Indeed, it’s true: Estonia and Sweden—have been sharing the love when we analyse the scores from both the semi-finals and finals since 2004. None of the other pairings come even remotely close to a statistically significant correlation. Admittedly, the effect size here–around 30 per cent–is not huge. To drill down even deeper, the correlation is rather specific: when Sweden gives Estonia points, Estonia gives Sweden a lot of points. Language: not really. If anything Finland and Estonia, Denmark and Iceland, or Norway and Sweden would make more sense. Estonian is a Finno-Ugric language; Swedish is a Germanic one. Since 2004 Estonia’s sent three songs in Estonian, one in Võro, five in English and one in…let’s call 2008’s dialect bad attitude. Sweden’s not sent any songs in Swedish since 1998. Artist: nope. Since 2004 one Estonian entry was performed by a Swede (Sandra Oxenryd, 2006; did not qualify). Sweden’s never selected an Estonian singer. Songwriters: nuh-uh. None of the 2004-2015 entries for Estonia were written by Swedes, nor vice versa. If not language, artist or songwriter, what could explain this correlation? What may be in play here is what sociologist Pierre Bourdieu called a “logic of distinction”. Bourdieu argued that taste is more than personal preference: it is reflective of culture more widely. Culture can have currency, serving as a form of capital—cultural capital, in other words. A logic of distinction means certain forms of taste become more important than others. Certainly the Swedish pop music industry is one of the more highly regarded ones globally. Swedish songwriters and producers—and, to a lesser but significant extent, artists—are in the charts across Europe and around the world. So Estonian tastes are arguably following an international logic of distinction: Swedish pop music is good. As well, Sweden has appeared in every Grand Final but one (although two entries were “saved” by juries). Six Swedish entries have been top 5 in the Grand Final, including two winners since 2004. So Estonia’s not alone in liking Swedish entries. They just like them a bit more consistently than the rest of their bloc: usually ranking Sweden in or near their top 5, and only giving Sweden null points twice in a Grand Final. Sweden less enthusiastic (average score to Estonia 2.54 points) but persistent support for Estonia is harder to parse. No less than seven Estonian entries remained stuck in a semi-final. Of the 5 entries that appeared in the Grand Final, three finished in the top 10 and two nearer the bottom of the table. Two of the top ten entries were sung in Estonian, one in English. Two were written and produced by Sven Löhmus, the other by Stig Rästa. In the end, there’s no evidence that the Scandinavian bloc has supported its members regardless of the quality of an entry. There is some evidence of support between two of its members, but not to an extent that skewed either qualification for a Grand Final or the final results in a Grand Final. Although Sweden has finished ahead of Estonia in every Grand Final except one, in 2009. In that respect the mean scores swapped in this little love fest are almost always aligned with the overall results. It’s also important to acknowledge that Sweden’s Melodifestivalen is the most competitive national selection each year. Artists and record labels in Sweden know that doing well at Melodifestivalen will almost always translate into record sales. Estonia’s fortunes have turned around since it launched the revamped Eestilaul in 2009. In fact, across the Scandinavian bloc, Denmark, Finland, Iceland and Norway also put an effort into their national selections.